It sounds too good to be true: Dinner done in one-third the time or less, using 70 percent less electricity and more nutrients preserved? The benefits of using a pressure cooker have elevated it to cult-like status in recent years. Fans even name their cookers and buy multiples. This is not your grandmother’s terrifying contraption with screws and gauges. Today’s stove top and electric models are sleek and, above all, safe. The electric models are programmable to become all-in-one appliances: straight pressure cooker, slow cooker, rice cooker, steamer, even yogurt-maker with the touch of a button. What’s the Right Pressure Cooker for You? Electric pressure cookers, such as the Tristar 6 quart electric pressure cooker, have the convenience of being programmable. You can pre-set cooking times and use the appliance for many different types of cooking. The stove top model heats more quickly than electric models and it’s easier to control the heat. The Fagor Duo 8 qt. cooker works with gas and electric ranges and is one of the easiest stove-top models to use. New to pressure cooking? Try an affordable, basic model like the Casa Essentials jiggle-top cooker. Today’s generation of pressure cookers can cook dry beans in less than half an hour, braise meats and make sure you never ruin rice again. But they are far more versatile. If you’re on the fence about buying one, here are eight convincing reasons that might get you hooked. One-pot meals in half an hour – Pressure cookers can get dinner done up to 70 percent faster. You can brown and saute, then add your liquids and other ingredients, lock the lid and bring to pressure. Make bone broth – Sure, you can make this nutritional darling in a slow cooker or stock pot, but you’ll wait a whole day to extract the minerals and gut-healthy collagen. It takes a pressure cooker less than two hours to do the same thing. Cheesecake – Whip up moist, perfect cheesecake in about 40 minutes. Prepare the crust and the mixture, put in a seven-inch pan, and lower onto the cooker’s trivet. A foil sling makes removal easy and prevents burns. Boil eggs like a boss – It takes just six minutes, like the conventional method, but you never have to worry about the water evaporating and blowing egg all over your kitchen. Easier risotto – Banish the phrase “stir constantly!” This notoriously high-maintenance dish retains all of its creamy goodness when prepared in a pressure cooker. You saute onions and rice for about five minutes, add your stock and cook on high pressure for about 15 minutes. Sure beats a half hour of stove top arm workout. Fast oatmeal – Even hearty steel-cut oats are done in about 10 minutes. With programmable models, you can set it to start just before you wake up. Baked goods – There are several recipes that let you steam bread in the cooker. You can even use an old-school coffee can to cook it in! Don’t expect crusty baguettes; the result is more like soft white, but hey, you made it yourself without preservatives! Fresh, organic baby food – One frequent newbie fail is processing veggies for too long, resulting in mush. No worries! Turn it into homemade, organic baby food. Another mushy veggie save: puree and freeze in small silicone containers or Martha Stewart ice cube trays to pop into soups and sauces. 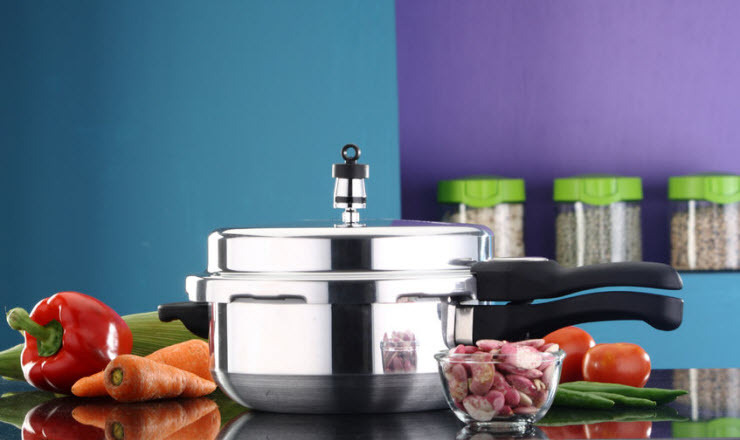 Convinced a modern pressure cooker would be a good addition to your kitchen? With a growing number of models and recipes, you could almost kiss that stove goodbye. And Macy’s always has a coupon code to save you money on pressure cookers, slow cookers and other cooking appliances.